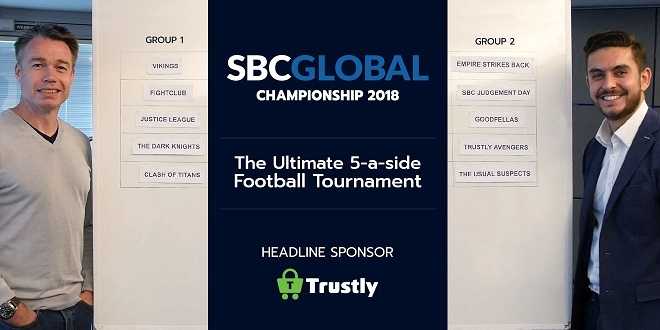 Trustly hopes to celebrate 10 years in the online payments industry by winning the SBC Global Championship, after its two teams were kept apart in yesterday’s live draw. The draw for next week’s competition at Stamford Bridge (22 May) was made by ‘Trustly Avengers’ captain (or Trustly Gaming Director) Samuel Barrett and Chelsea legend Graeme Le Saux, who will be playing for ‘SBC Judgement Day’. The rest of a sizeable Trustly contingent will line up for ‘The Vikings’, while other teams include the Intertops dominated ‘Empire Strikes Back’ and a ‘Clash of the Titans’ side with a trio of OPTIMA representatives. In total there are 10 teams featuring more than 80 players from some of the sports betting industry’s leading operators, suppliers, affiliates and media organisations. For the full lineup of team names and players, click HERE. The five-a-side tournament, played out on the pitch at Stamford Bridge in Chelsea kits, will be officiated by former FIFA and Premier League referee Dermot Gallagher. Besides the coveted SBC Global Championship trophy, winners will take home fantastic prizes such as a VIP Box day at Stamford Bridge during one of the 18/19 season games. Meanwhile, the event will feature a pitch-side barbecue after the group phase and an evening social at the Jam Tree, one of Chelsea’s favourite local hangouts. Le Saux added: “I’m particularly looking forward to the SBC event on Tuesday; it’s the first time that most of these guys have been down here. What they will hopefully experience is that feeling you get when you walk out onto your home pitch and there is a crowd, very tight to the pitch and a wonderful surface – it’s a really exciting stage. If you are interested in joining us for pitch side BBQ and drinks or the evening social, please contact us on marketing@sbcnews.co.uk.